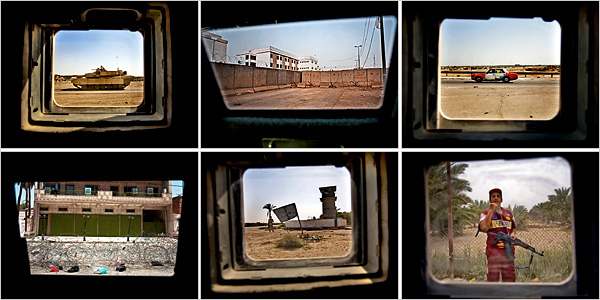 What we see is a thoroughly fragmented Iraq, a world of disconnected moments in space and time; although we clearly see what is there, it is hard to know what it might mean. We have no sense of context outside the vehicle and no basis for response to what is seen. Each fragment appears as a specimen, something to be handled objectively and perhaps pieced together, but having little value in itself. Thus, the images remind us that politics is susceptible to what James C. Scott calls Seeing Like a State. Scott reminds us that “Certain forms of knowledge and control require a narrowing of vision,” and political control can depend on seeing the world from a distanced, amoral perspective. This “tunnel vision” separates the viewer emotionally from the scene in order to maximize strategic rationality without regard for complexity or moral consequences. As Scott documents, when such political thinking is backed by state power, the results can be catastrophic. Ignatieff’s essay is a thoughtful meditation on political judgment, but it inadvertently provides a recipe for making additional mistakes. Many were swept away by moral zeal in supporting the war, but some of those who opposed it made better judgments precisely because they could imagine and emotionally register the havoc that would result. Becoming less emotional may be good advice for some, but it is not the key to practical wisdom and it is not likely to make sense of Iraq. The same is true for the citizens who elect those leaders, and for that we need other images. Flag-draped coffins, for example. . . .
John Louis Lucaites is Professor of Rhetoric and Public Culture in the department of communication and culture at Indiana University. John, along with Robert Hariman, are co-authors of the newly released No Caption Needed: Iconic Photographs, Public Culture, and Liberal Democracy, and the blog No Caption Needed.